Have questions about how our program would work for you? Email us now at info@carolinaimplant.com. Referring doctors please click here. We use the most advanced dental planning software available for optimal patient care. 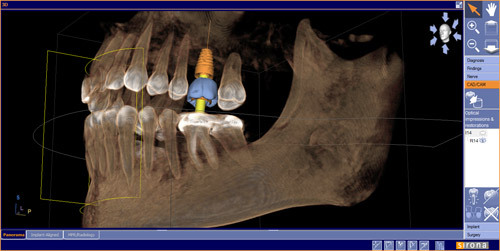 We are now able to combine the digital plan for the tooth we wish to create with the placement of an implant in the ideal location to support it. This greatly reduces our cost and we pass that savings on to our patients for a price of only $1995! Replacing a tooth with a dental implant is the closest thing to starting over that dentistry has to offer. The tooth is made complete by design and delivery of an "implant", "abutment", and "crown"
Dr. Daily has extensive experience in not only placing the dental implant, but restoring it with a crown as well! This ideal treatment choice has now become part of a single process at a single office. We love placing dental implants and restoring smiles! Come on in for a free consult and hear how excited we are to put this new technology to work for you! NEED DAMAGED TEETH OR BRIDGES REMOVED? CONSIDERING DENTAL IMPLANTS TO LOCK DOWN A PARTIAL OR COMPLETE DENTURE? WE ARE HAPPY TO HELP WITH THESE SERVICES TOO! We are located in North Raleigh, near the intersection of Falls of the Neuse and Newton. Ravenscroft High School is just next door.